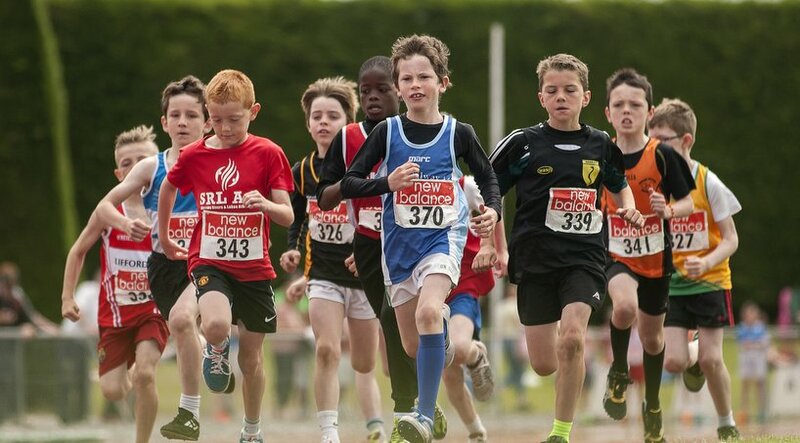 Closer to a 1,000 of our future stars of the sport competed in Tullamore Harriers Stadium for the Juvenile Team & Relay Championships of Ireland on Saturday, 21st of June. The competitions brought young athletes from all across Ireland to compete in the following events: 60m, 300m, 500m, 600m, Long Jump, Turbo Javelin and Relays. The event in Tullamore is unique in that all the athletes compete in pairs with the aggregate times or distances of the two athletes determining the finishing places. In the U9 age group Cork clubs were very dominant with Bandon AC winning the 300m, 60m and 4x100m on the track with Leevale AC coming out on top in the Long Jump. In the turbo javelin the Inny Vale AC duo combined to win the title. At U10 level Ratoath AC won the 500m while Riverstick/Kinsale AC were the winners of the 60m and long jump titles. Templemore AC won the turbo javelin event and Youghal AC secured victory in the relays. Thomastown AC were the clear winners of the U11 600m with Leevale AC doing likewise in the 60m sprint, 4x100m relay and long jump events. Liscarroll AC won the turbo javelin. In the U9 boy’s events St Coca’s AC and Greystones & District AC won the respective 300m and 60m titles. Craughwell AC won the long jump and the Finn Valley AC duo combined well to win the turbo javelin. Kilkenny City Harriers just edged it in the relay to take the title. South Galway AC won the U10 500m title with Ennis Track recording the fastest sprints of the day with victory in the 60m. Naas AC went well in the long jump to claim the title with Boyne AC coming out on top in the turbo javelin. Carlow club St. Laurence O’Toole AC won the 4x100m relay. Finally in the U11 age category the Ballinasloe & District AC duo combined to win the 600m with Nenagh Olympic speeding to the 60m title. Middleton AC and Dunleer AC were the respective winners of the long jump and turbo javelin titles. The final event of the day was the U11 4x100m relay with Ballinasloe & District AC coming out on top. The event wasn’t just about the medal winners with nearly 1,000 young athletes taking part and enjoying themselves in the various events throughout the day in Tullamore.